In a diversity of habitats, from lowland hardwoods, especially in the southern part of the state, to hemlock-white pine-northern hardwoods forest of the north, becoming especially common in the western Upper Peninsula. As is true of the other birches, the pistillate scales and bark of B. alleghaniensis are variable. Very old trees, as in virgin stands in the Upper Peninsula, may have very furrowed or checkered dark bark. Trees in swamps of the southern Lower Peninsula may have dark brown or blackish bark, which peels very little if at all; such trees hardly resemble the widespread typical yellow birch with light yellow-brown, peeling bark, and have sometimes been erroneously referred to B. lenta (which differs in having smaller, nearly or quite glabrous and less densely ciliate scales in the pistillate aments). Betula lenta and B. alleghaniensis both have a characteristic odor and flavor of wintergreen in the crushed bark of young twigs. Betula nigra, river birch, lacks the wintergreen flavor and has leaves pale beneath with margins both toothed and undulate or shallowly lobed; the fruit ripens in late spring or early summer, with wings narrower than the body; the bark is pinkish, curly and tattered-looking, and the number of leaf veins is less than in B. alleghaniensis. 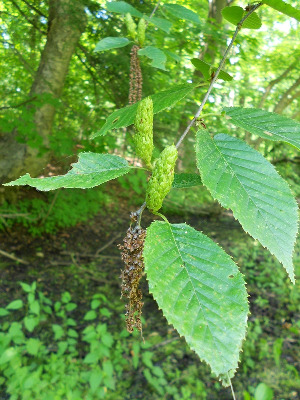 Betula nigra grows in wet places and is known in northwestern Indiana; it should be sought in southern Michigan, where it is sometimes planted but seems never to spread. The leaves on short lateral shoots are usually in pairs, whereas in B. papyrifera they are usually in 3’s. However, hybrids with B. papyrifera may be less rare than usually supposed; they have short shoots with both 3 and 2 leaves per shoot. Hybrids with B. pumila are described under that species. The wood of yellow birch is one of the most valuable timbers in Michigan. It is strong and close-grained, polishes well, and is of special importance in furniture and veneers. MICHIGAN FLORA ONLINE. A. A. Reznicek, E. G. Voss, & B. S. Walters. February 2011. University of Michigan. Web. 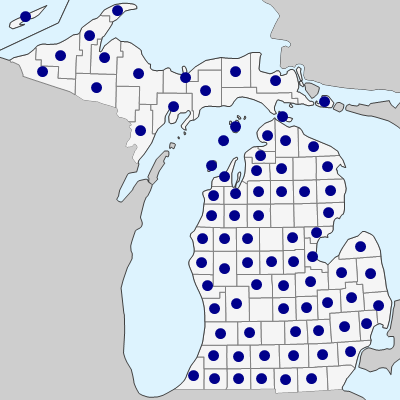 April 26, 2019. https://michiganflora.net/species.aspx?id=550.